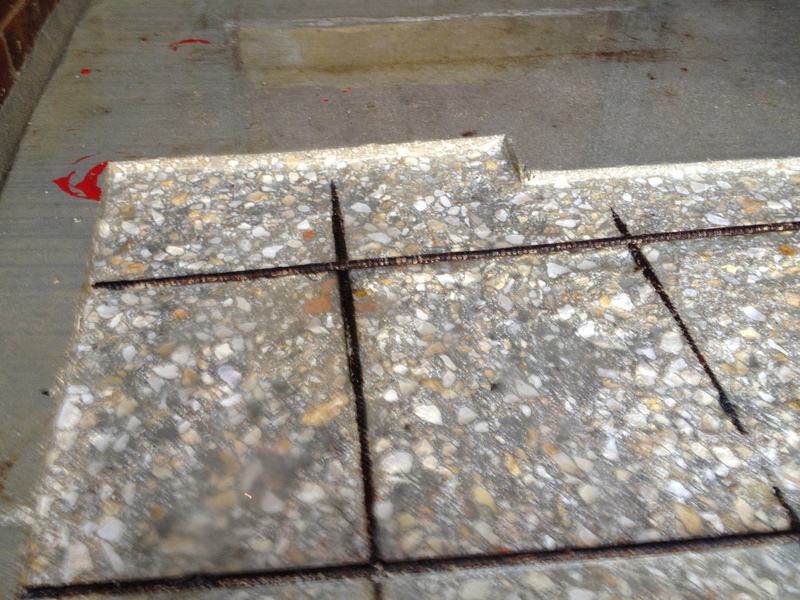 Concrete spalling is often caused by improperly placing the rebar or wire mesh when pouring the concrete. If the rebar is to close to the top of the concrete slab, as water soaks into the concrete it will start to corrode the rebar. This will cause the rebar to expand, weakening the concrete above the piece of rebar. 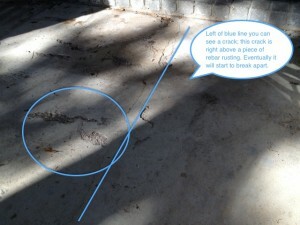 If you look left of the blue line, you will notice there is a crack starting to form, this crack is right above a piece of rebar corroding. 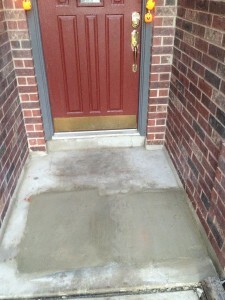 When we tap the concrete with a hammer we hear a hollow sound. 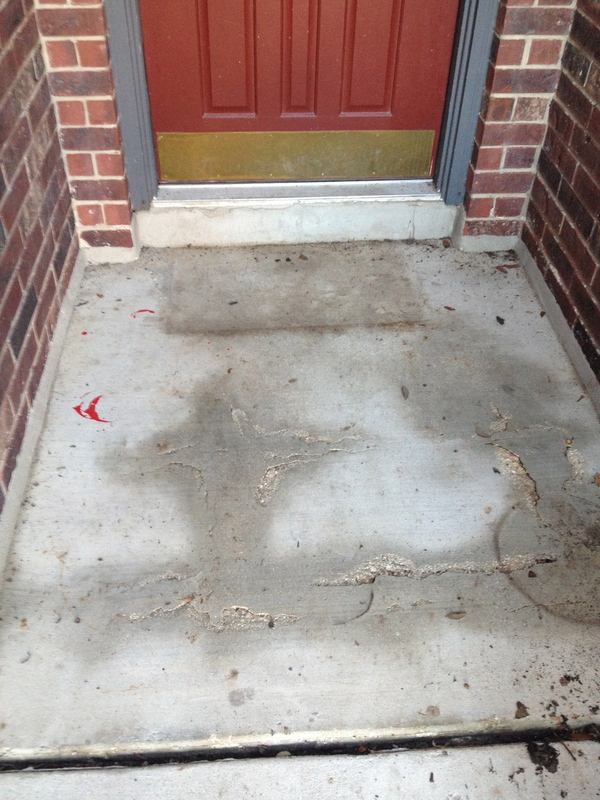 To repair this we have to break out all the loose concrete, cut 90 degree edges, pressure wash & clean the rebar, and apply a non-shrink repair mortar. Right after we start to chip out the bad concrete a piece of rebar started to stick out. 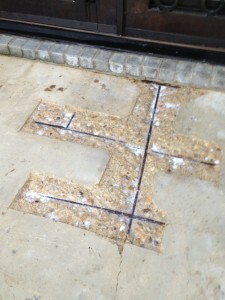 This was the main cause of the damaged concrete. 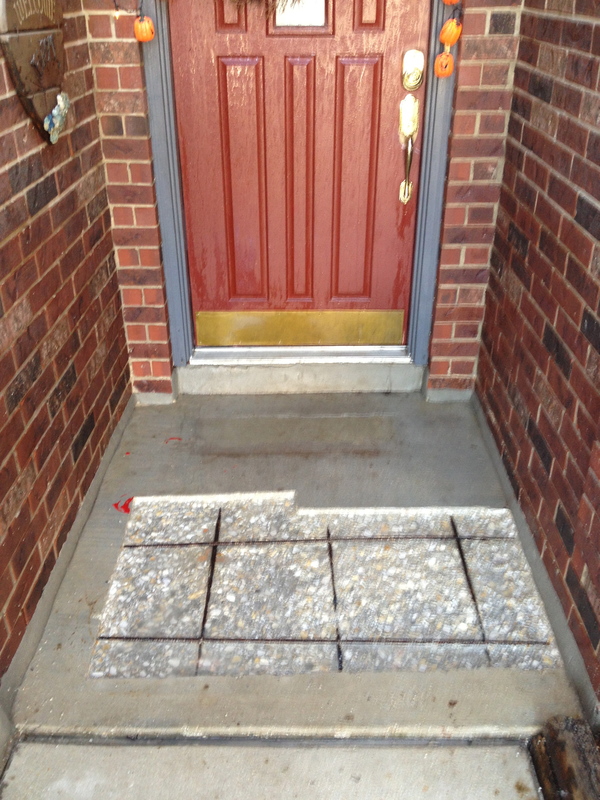 It is very important to place rebar and wire mesh at the proper place when pouring concrete. After the concrete was chiseled out we applied Miracote RM 2 and then finished of the spalled concrete repair by resurfacing the area with Miracote MPC, and then applied a grey stain to match the bricks. 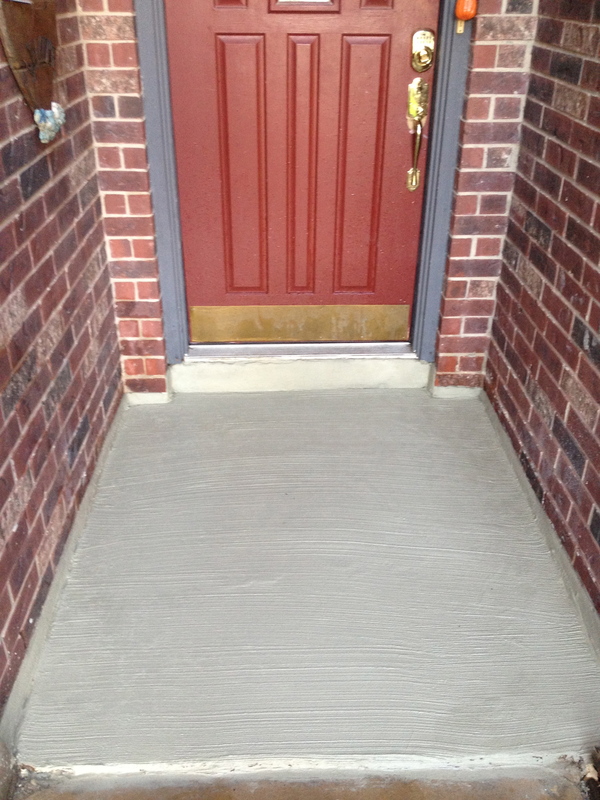 This concrete entrance way had a very big area delaminating. 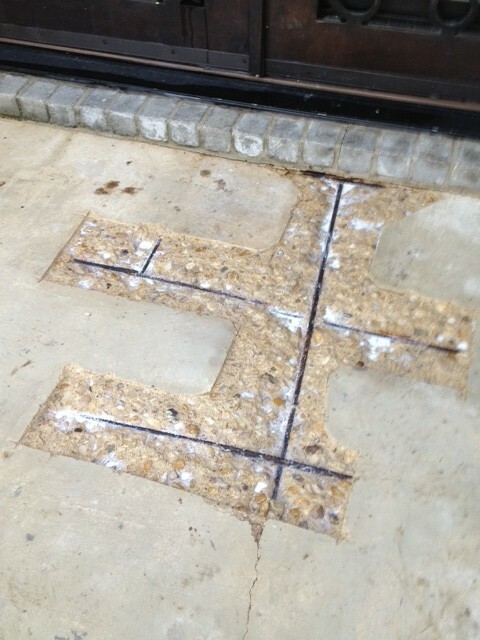 Before we begin to repair the concrete we have to check to see if there are any hollow spots in the concrete. We check by banging a hammer or running chains over the surface of the concrete. This concrete had a lot of hollow spots that were chiseled out. You can notice in the picture above the edges are cut 90 degrees, this is because you do not want the repair mortar to be feathered out at the edges. 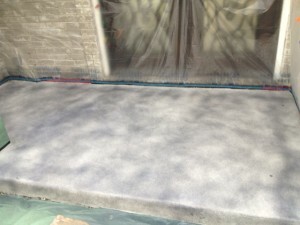 After the concrete has been resurface you apply a concrete stain to add color to the newly refinished concrete. 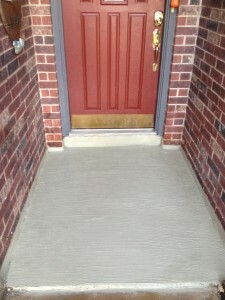 To properly repair spalled concrete, all of the loose concrete needs to removed and the edges need to be cut 90 degrees so that the repair mortar will not break up in the future. 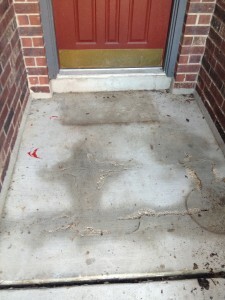 After the loose concrete has been cut out, the area is pressure washed to clean any loose rust and particles. 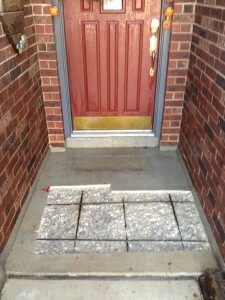 Then the area is filled with a high strength repair mortar. 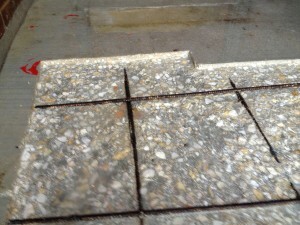 Fixing a concrete step, depending on the extent of the damage must also be cut out completely at a 90 degree angle to prevent the repair mortar from feather-edging. 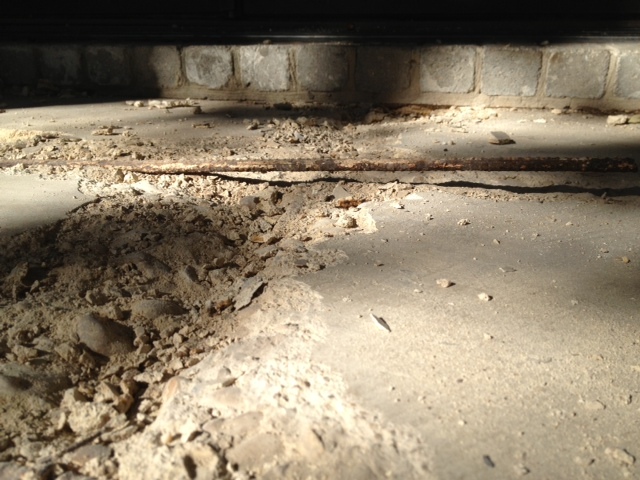 If you can, try to completely expose the rebar in the concrete for the repair mortar to grab on to. If you cannot expose the rebar you can add a piece by drilling in bolts into the concrete then tie a piece of rebar to them. Make sure there will be at least one and a quarter inch of repair mortar on top of the rebar. 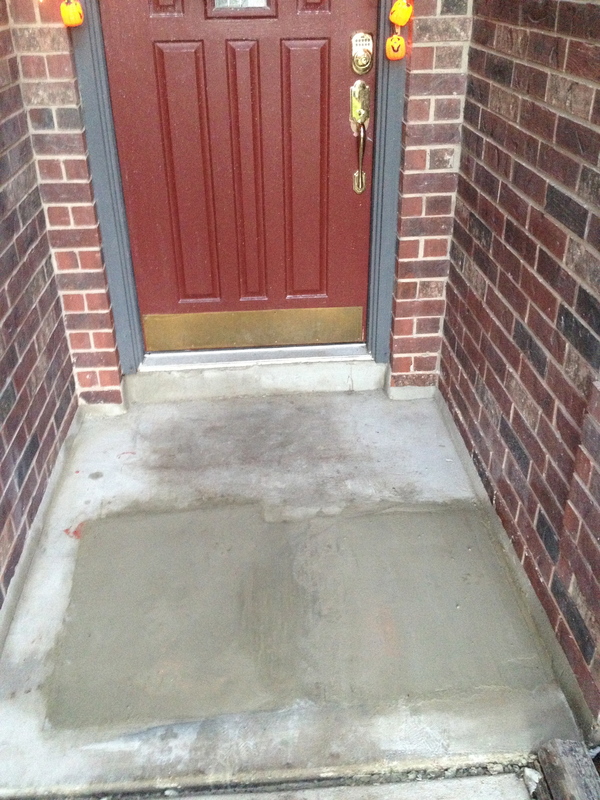 Once the repair mortar is set the repair is completed; although, you can resurface the whole concrete patio with a polymer modified cement to completely hide the repair area. After resurfacing the concrete you can acid stain the patio to add some color to the polymer modified cement.